Cetya has developed a portfolio of over 30 largazole analogs to evaluate in various therapeutic indications. The largazole scaffold also can be further modified to develop optimized analogs suited to a particular clinical indication. Much of the research at Cetya will be devoted to the study of the structure/activity relationships against a specific biological readout predictive of efficacy in a certain clinical indication. Additionally, Cetya has the capability of targeting any of its analogs to any cell type of interest for treatment of a particular clinical indication. Targeting is the classic approach to reducing systemic toxicity, as evidenced by the development of monoclonal antibodies or alternative formulation strategies such as nanoparticle delivery systems. Cetya will incorporate this targeting function where necessary to shift the risk-benefit ratio in the patient’s favor. Coordinating DNA expression is an essential process for all living systems. The cell’s ability to execute the programs of life and death by regulating gene expression is controlled by complex interactions between signal transduction pathways, transcription factors, and modular protein regulatory complexes. The nucleosome is the fundamental unit of chromatin and is composed of 146 base pairs of DNA wrapped around an octamer of histone proteins (2 each of histone proteins H2A, H2B, H3, and H4). Histones are modified in different ways, and one of the most studied set of modifications is the pattern of acetylation/deacetylation (see figure). Histone acetylation adds an acetyl moiety to the ε-amino group of the lysine tails on the histone protein. This modification is highly dynamic and is accomplished by a set of enzymes called histone acetyltransferases (HATs). HATs are generally understood to alter chromatin structure by masking the positive charge of key lysine amino acid residues in the “tail” region of the histone proteins, thereby reducing the electrostatic interaction between the histone tail and the negatively charged DNA backbone. The process of histone acetylation creates an open chromatin structure that is associated with transcriptionally active DNA. HATs, including well-known family members p300/CBP, MOZ, and SRC, are transcriptional co-activators found in large multi-protein regulatory complexes that are recruited to promoter regions of target genes by transcription factors bound directly to the DNA. The reverse process of acetyl group removal, or deacetylation, is accomplished by histone deacetylases (HDACs). 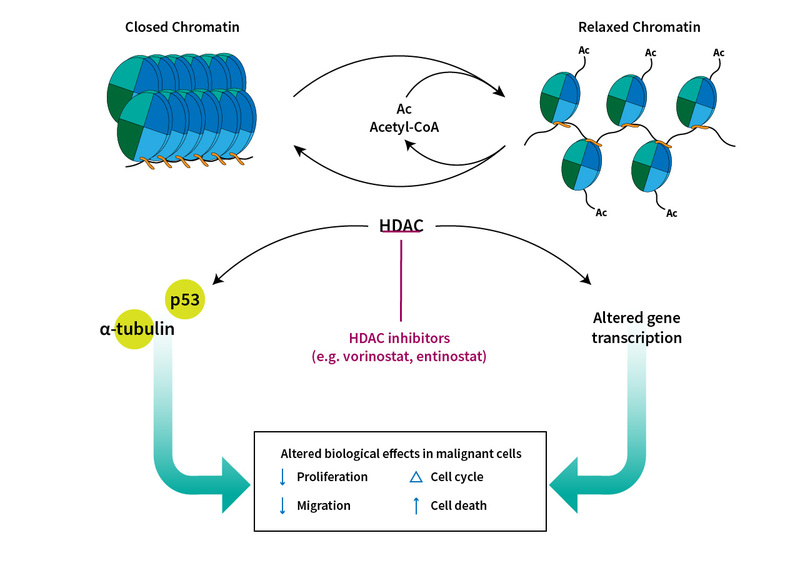 The activity of HDAC enzymes is the reverse of HATs and creates transcriptionally quiescent regions of chromatin. The gene regulatory functions of HATs and HDACs are shown schematically in the figure below1. The basis of Cetya’s proprietary HDAC inhibitor (HDACi) platform is the scaffold of the natural product largazole. The macrocycle scaffold is uniquely suited to exploit the differences in sequence and charges on the surface of HDACs. The rigid scaffold binds tightly to the HDAC surface and orients functional groups in well-defined positions. To date, over 30 analogs have been synthesized with potent class I HDAC inhibition and targeting capabilities. This rational drug design strategy combines the power of computational SAR modeling (by Cetya Scientific Advisory Board member Olaf Wiest) and modular chemistry approaches, leading to the successful synthesis of strong class I HDAC inhibitors with low-nanomolar potency. Further extension of the platform has been achieved by creating a series of largazole analogs that have isosteric (O to N) replacement of the relatively labile depsipeptide linkage found in largazole and romidepsin to create a peptide linkage closing the macrocycle. The hypothesis for this lead optimization strategy is well founded and could potentially improve metabolic and hydrolytic stability of drug candidates. Although currently hypothetical, the improved stability of the amide linkage in low-pH environments might also enable oral dosing and cellular endocytosis when using targeting strategies. Early proof-of-concept results demonstrate that this lead optimization strategy has improved pharmacokinetic profiles relative to largazole as well as enhanced the class I selectivity window approximately ten fold relative to the parent compound. Parent compound prodrug CT-101 and base scaffold. CT-101 is rapidly processed in vivo via esterase or lipase to generate the active thiol compound that complexes with the Zn2+ atom of HDACs.